The Everyday Gentleman was conceived back in 2010 when I started to develop ideas and anecdotes about all the aspects of being a real gentleman. I wanted to tell my story, get a little philosophical and maybe have some fun along the way. I started writing a blog in 2011 that exemplified these ideals. I hoped to float above the murky waters of the blogosphere with my own take on things; to be authentic and real — with a storytelling style that was honest almost to a fault — and stand out amongst the rest. It worked and it was great. I started to see results as I wrote my posts. People were interested. I branched out to fashion and music, oftentimes using other media to publish collaborative works of writing and art. Over time, I felt I was in a position to take this adventure a little further. My own style dictated where my path would take me: as my own beard grew, as did my passion for great grooming products. I felt as others did: that products out there still seemed — for the most part — unaccessible and expensive. The opportunity presented itself to make my own grooming oils while avoiding overpaying or gambling on quality. Enter The Everyday Gentleman Grooming Oils. These specific blends are hand crafted in small batches and made with pure essential oils. Each one moisturizes your facial hair and has you smelling amazing all day long. I created this line of grooming oils to be accessible while remaining authentic. In doing so, I hope you join me in breaking down any stigmas attached to growing and grooming beards as well as facial hair of any kind! Take your grooming seriously and do it with pride. Go beyond the norm and of what’s expected. Go beyond the beard. I want you to have access to wonderful products and experience the best. For these reasons and more, I think you will love The Everyday Gentleman. Currently shipping to the U.S. only; stand by as more regions become available! 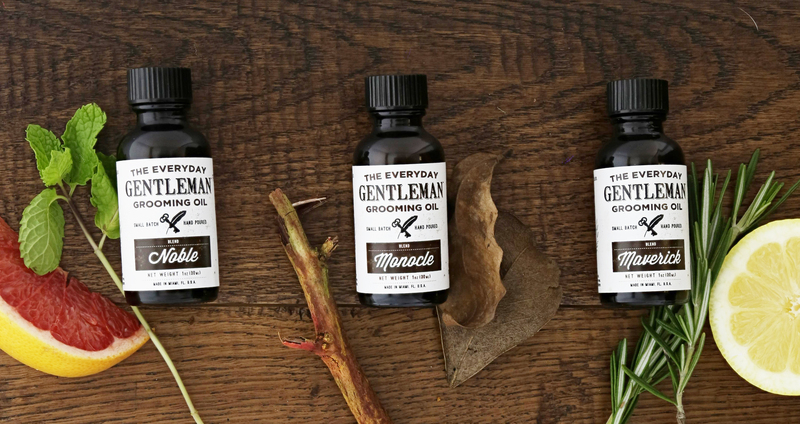 The Everyday Gentleman Grooming Oils are made with pure Essential Oils. However, you should always test for skin sensitivity. Your best bet is to use this on your hair. I believe in balance in all that we do and this is no different: excessive use of any oil can lead to skin sensitization. Although it’s an obvious one, I have to mention that you should keep these products out of your eyes, ears, or nose. Do not ingest it. The point is important enough that it is worth repeating: it’s best to use The Everyday Gentleman Grooming Oils on your hair. Not all oils are created equal, and The Everyday Gentleman rises to the top with unique blends. Still, it’s worth saying that you should test oils carefully. Never use these oils in a way not recommended here. You’re meant to look sharp and smell great. Go beyond the beard. But always be mindful. Cheers!